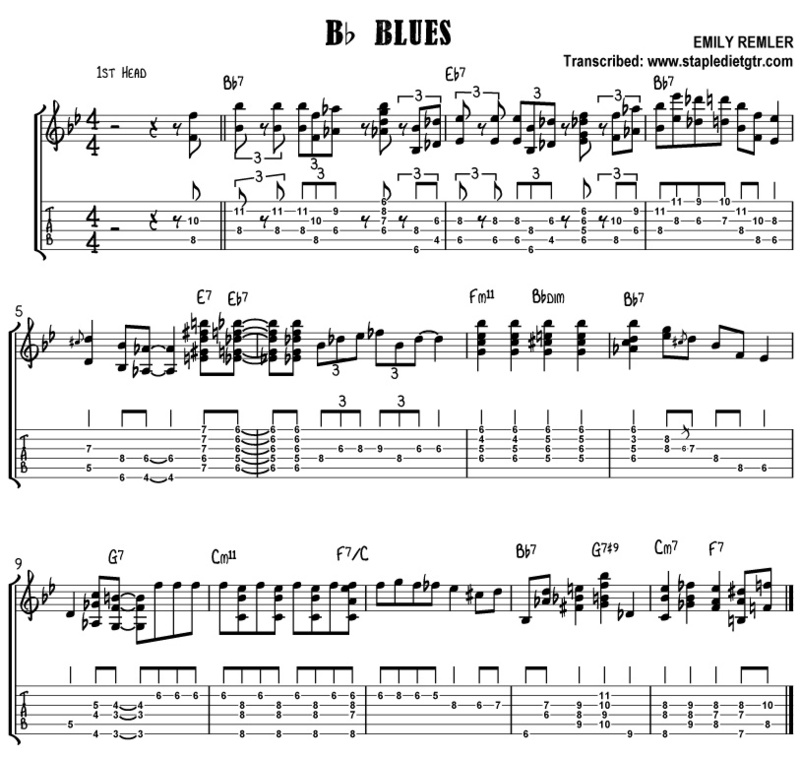 I’ve been admiring the unnacompanied Bb Blues played during the opening credits to Emily Remler’s video /DVD “Bebop and Swing Guitar“. Here’s the first head. Notes on the page don’t express the swing and groove that Emily has. Check out the recording by clicking on the audio player icon above, or the video clip found below to hear how it should sound. This entry was posted on Monday, June 2nd, 2008 at 10:45 pm	and is filed under jazz guitar. You can follow any responses to this entry through the RSS 2.0 feed. You can leave a response, or trackback from your own site. I keep a google search for Emily’s name so this transcription popped up today. It’s very nice what you have done so far and I really like the look of your page here, it’s very crisp and bold. If you would like to share it with us when it’s finished I would be most happy to post it on the guest transcriptions page for my readers to have access to or at least put a heading and link to your page. Having variations and different takes on songs is a great advantage to offer those that are looking for ways to play a work of music. Here’s how it would appear. Thanks either way, even if you simply want to decline. hi, where can i find the other heads of this song?